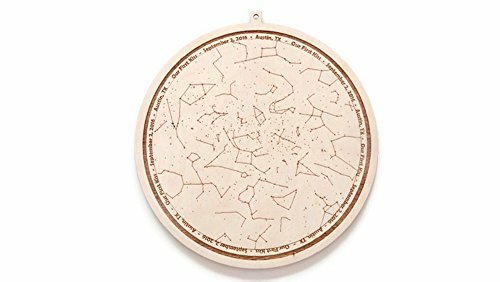 Commemorate a special moment with the Star Map wall art! The wall art features the stars and constellations as they would have appeared at the exact time, date, and location you provide. Bordering the star map is text you provide for the event name, date, and location. On the reverse, add a special message to your loved one (optional at additional cost). Celebrate a birth, first date, anniversary, wedding, or any other special day with this one-of-a-kind wall art made just for you. Use the text boxes to provide the name for your event, the date and time (if you do not have a specific time, I will use midnight), and the location. Would you like to add a special message on the reverse side? Use the drop-down menu to select "Add Custom Message". The wall art measures 9.5 inches (24.1 cm) wide by 10 inches (25.4 cm) high. Made from 1/8-inch thick birch, the wall art is hand-sanded and comes ready to hang with just a push pin or small nail. If you have any questions about this product by Modern Laser Studio, contact us by completing and submitting the form below. If you are looking for a specif part number, please include it with your message.